For my graduation I really wanted to do some newspaper print nail art. I read everywhere that you need rubbing alcohol to do this effect, not having any I decided to try something else. 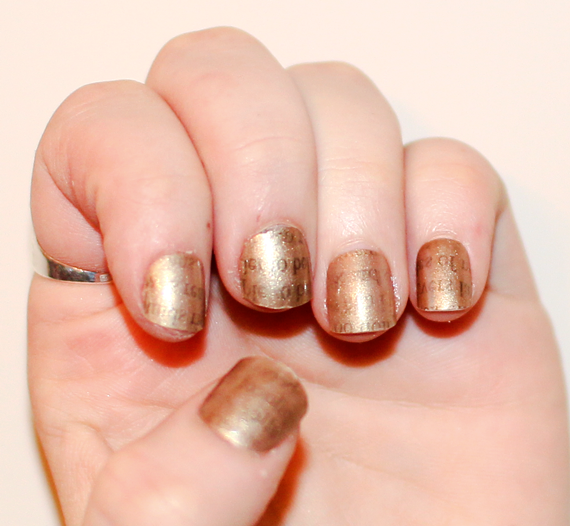 So heres my how to do newspaper print nail art tutorial without rubbing alcohol! My tip – listerine. I did these nails on fake nails first and stuck them on after decorating although they can be done straight onto a natural nail. First off I painted my nails with Models Own Nail Polish Gold Rush and left it for ages to make sure that it was really dry. I cut out pieces of newspaper squares, making sure that it was print on both sides, rather than adverts or pictures. I applied listerine with a cotton bud then applied the newspaper piece. Press it down firmly and carefully peel back. Repeat this on the 10 nails and leave them to thoroughly dry. I struggled with the letters smudging when applying the topcoat so I thought about hairspray to fix the print. I sprayed hairspray all over the nails and again left them to dry. Once really dry I added a top coat to finish.